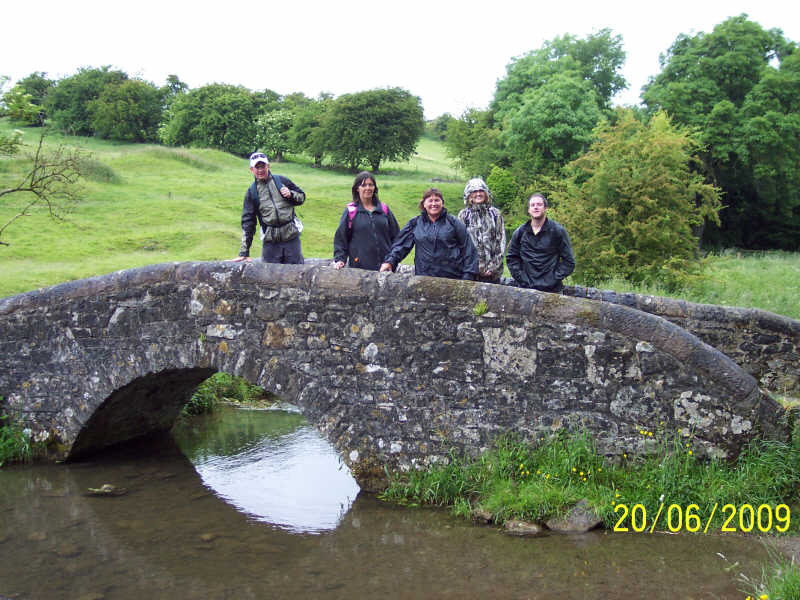 Regrettably the opening chapter of our annual walk page over recent years has been dominated by the poor weather we have endured on our one fundraising day out in the English countryside. 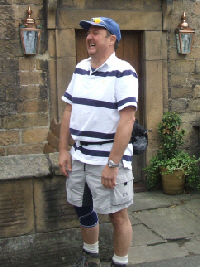 As any experienced British holidaymaker will know, it is unwise not to pack suitable rain-gear along with your shorts, sunglasses, and suntan cream, so as to cover all the options the British climate can offer. And, as it was in recent times, so it was again on June 20th 2009, when having basked in glorious sunshine for the preceding days leading up to the walk (and again in the subsequent days thereafter) we were disappointed that the occasional sunny periods were accompanied by grey overcast skies, and rain showers. both the 22 mile and 9 mile walks had once again been planned by event organisers Gerard Mitchell and Peter Mackie. 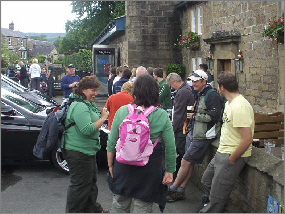 Strong consideration had been given to the locations and amenities of the checkpoints at The Red Lion (Birchover) and The Devonshire Arms (Beeley), and these proved to be popular with all the walkers, particularly the ladies; and this of course raises an important issue. I am reliably informed that nipping behind a tree to spend the proverbial (female) penny when zipped and buttoned in full walking outfit is not a straightforward task. It is of course a very delicate process, and to accomplish the task requires skill, dexterity, and the ability to view the surrounding countryside with 360 degree vision, whilst at the same time managing several difficult ‘wardrobe malfunctions’. Some may say, ‘how did we ever win two world wars, when ladies can’t go to the loo outdoors’. Whilst we at three peaks challenge.com would never endorse such a discriminatory comment, it is nevertheless a major consideration in the planning of such events that these issues are not taken lightly. It is therefore, a testament to the honourable concerns of our two (male) route planners that these appropriate considerations were implemented. 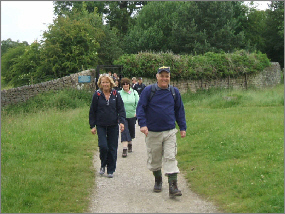 walk when one of our participants virtually ran around the 26 mile Three Peaks course so that he could get home for his cricket match in the afternoon, during which he achieved the aforesaid 6 wickets and 50 runs - Ed). 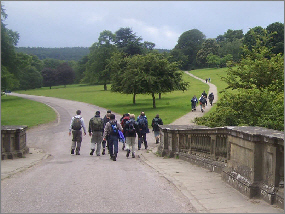 We are just crossing Chatsworth Bridge spanning the River Derwent before taking the right had fork along the path up and over to Edensor. Shaun Hardwick is the back marker here but I’m sure he’ll be right up there with the leaders as they hit the finishing line. 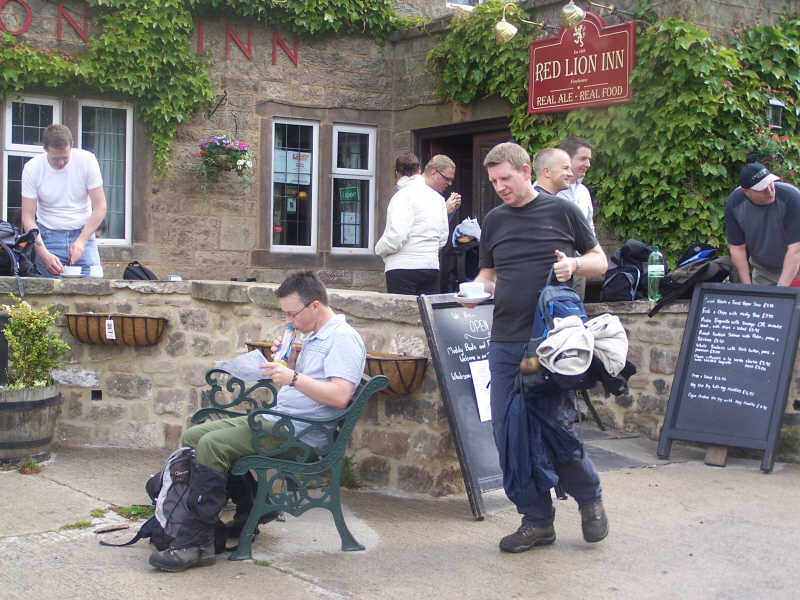 themselves out of bed and made their way to Baslow for the 06:00 start of the 22 mile walk. 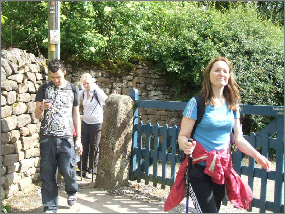 The remaining 43 will start the 6 mile walk at 11:45. 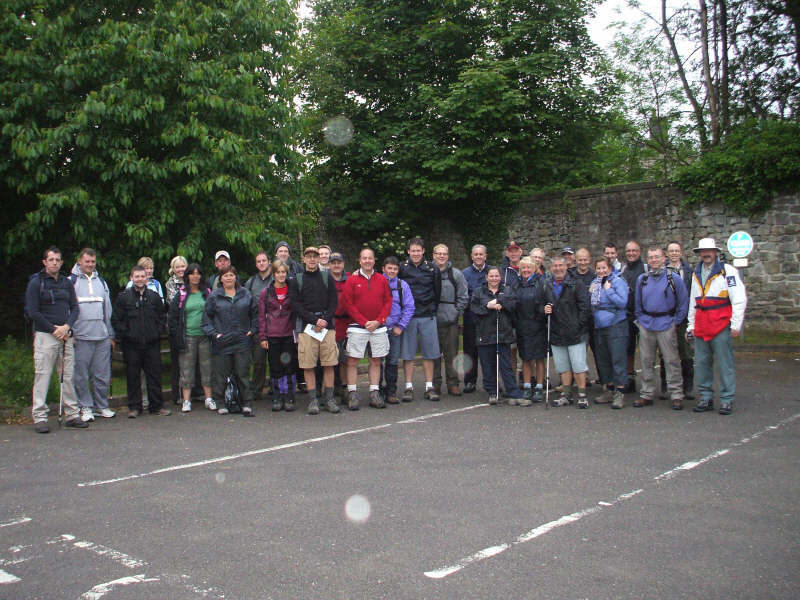 As always in our starting line-up there are a lot of regular faces mixed with the very welcome first timers. It’s 05:55, we’re under starters orders but the first drops of rain are already starting to land on the camera lens. Here we are in the picturesque village of Edensor, which like most other villages in the area, is clearly identified as being part of the Chatsworth Estate by its paintwork. The soffit boards and fall pipes on the houses are painted the famous Chatsworth blue. You will probably notice Vanessa’s legs don’t look too shabby in those shorts either. 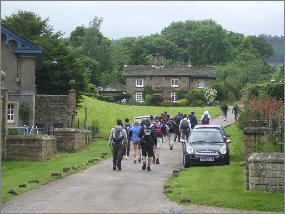 Although it is not in the picture we have just passed Edensor churchyard in which Kathleen Kennedy, sister to J.F. 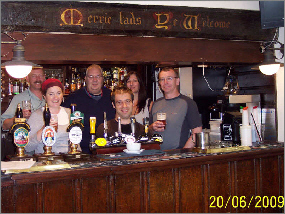 Kennedy, is buried amongst the Dukes of Devonshire. From here the path gets quite steep up through the woods to Ballcross Farm and then Bakewell. Mitchell is also in the picture but you can’t see her due to the fact that she's wearing her camouflage walking jacket. There is a prize for anybody who can spot her but my advice must be to not waste your time, you’ll never do it. 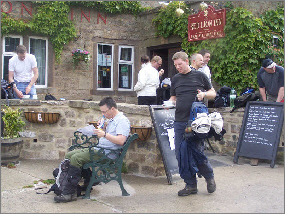 tea, coffee, bacon sandwiches or even a full breakfast for the really hungry. I can’t make out whether Laurence James is perusing his map or the menu. Thanks again Matteo. What sort of a carry-on is this at 10-15 in the morning halfway through a grueling 22 miler! (Well done Gerard. I’m pleased to see that you feel morally obliged to bring to our attention that some members of the group are drinking at this unholy hour. It took a brave and absolute man with a strong moral code of abstinence, like yourself to bring this indulgence to the attention of our readers. Well done !... Ed). 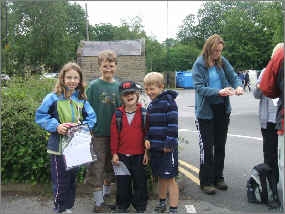 Here we have the youngest people to ever take part in our event, and judging by the look of them I would guess they range between five to ten years of age. 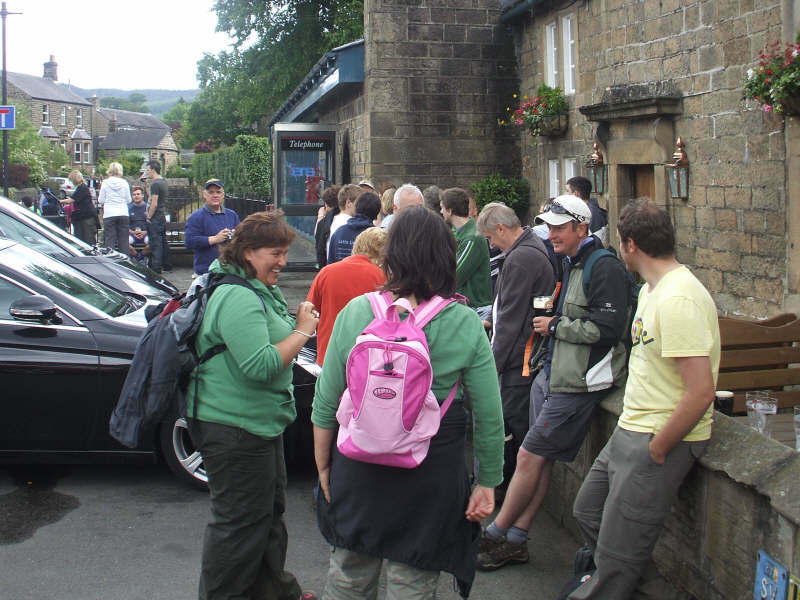 With their maps and route guides at the ready they look eager for the off. From the left we have Ella, Oliver, Alexander and Benedict. 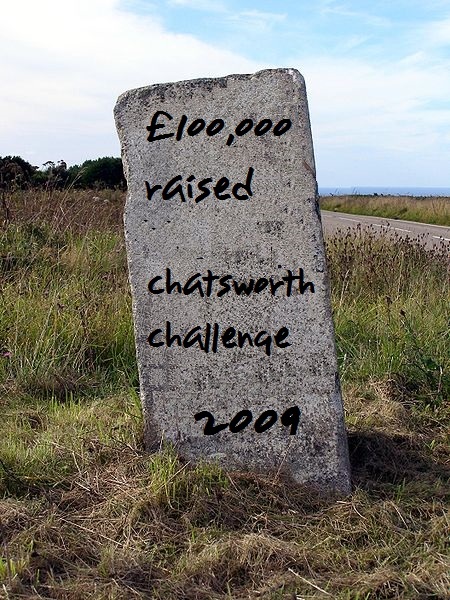 Ella had raised funds by walking around her local summer fair called "The Gallop" and asking for donations for her Chatsworth Challenge nine mile charity walk. She and her friend Molly also set up a stall (the sale articles of which were taken from their respective homes) with all proceeds being donated to the charity fundraising. 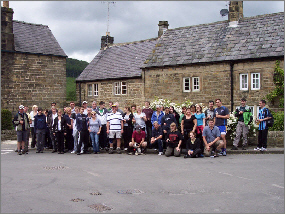 It really was terrific to see young people happy to get involved in a 9 mile slog up and down the hills to help with our fundraising, and to be fair they made it look easy. Louise Lavelle is studying her clipboard to ensure everyone is present and correct before the off. 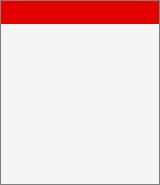 without anyone watching)! Back to the car park where a rather suspicious looking car park attendant was goose stepping around the car park – well it takes all sorts. Time for a group photo once we had got everybody in one place and managed to drag Margaret and Stella away from waving goodbye to three very nice leather clad bikers, who declined to walk with us. (They were very nice though – calm down girls). 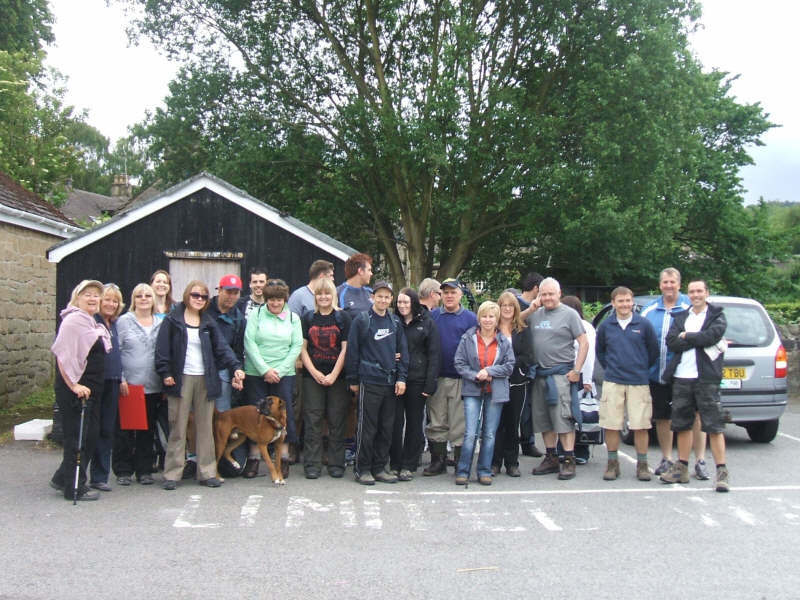 Everybody looks enthusiastic and ready for the challenge ahead apart from Danny and friends on the back row who look far more interested in what’s going on behind them... perhaps it was the strange car park attendant slapping a notice on their car. result in the kissing gate – Margaret and Anne are looking a bit sheepish behind him) and a chorus of ‘I’m happy when I’m hiking’ – which seemed a very appropriate song... shame nobody joined in! 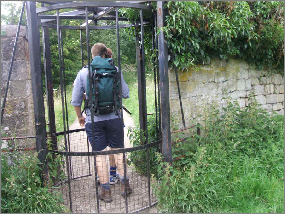 In fact most were looking like turning back through the kissing gate. 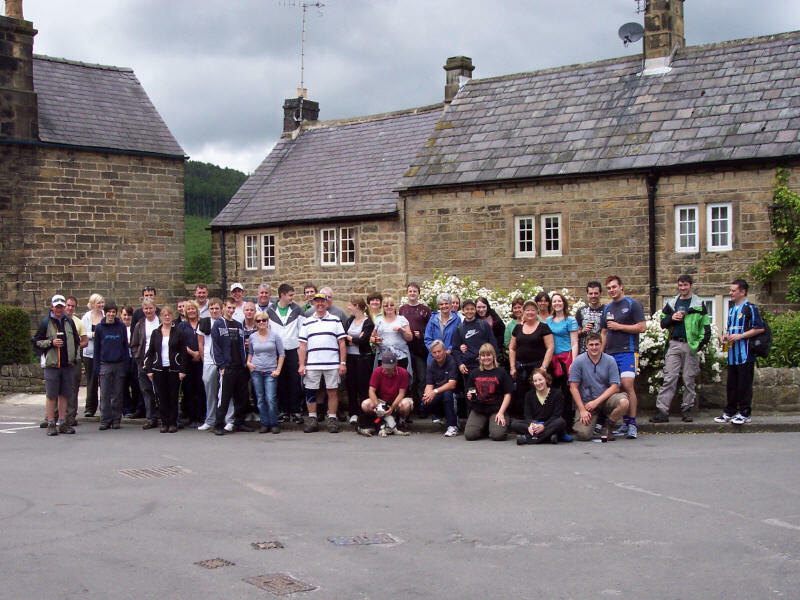 A well deserved break at Beeley. 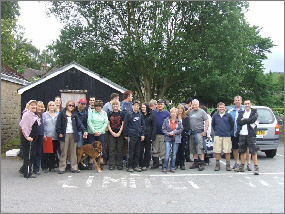 Most of this lot had 16 miles under their belt and were still smiling and they had 6 miles to do yet. Graham in the background is posing for the camera again! 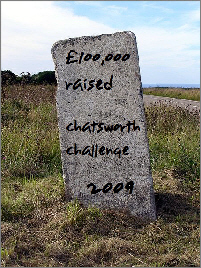 2009 marked a significant milestone in our fundraising efforts when our total sponsorship raised to date passed through the £100,000 mark. 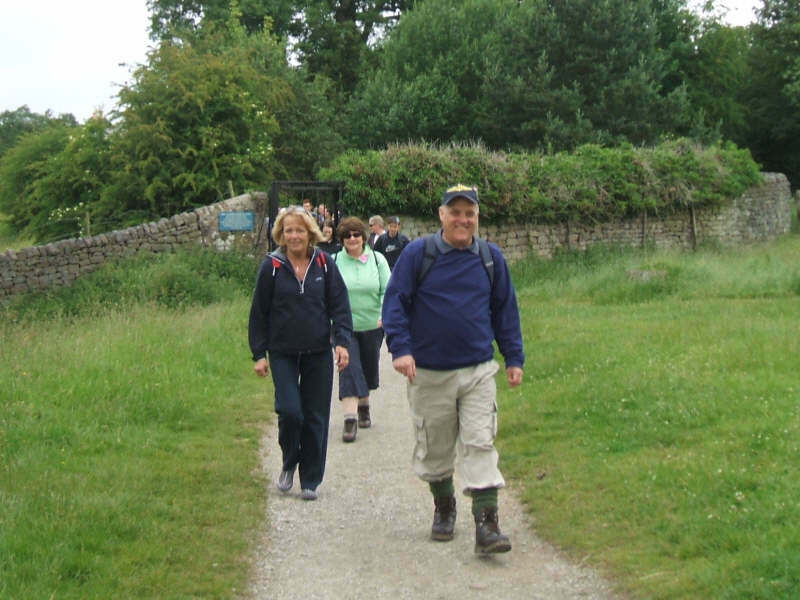 We’d like to take this opportunity to thank all of our walkers, our corporate sponsors, and everyone who has contributed in any way to the Dave Owens and Frank Goodall Memorial Fund. The following is a letter sent by Audrey Goodall to Gerard, and because it contains no confidential or any personal comments, and is a general thank you to all who take part in the walks, we have decided to reproduce it here as an open letter. 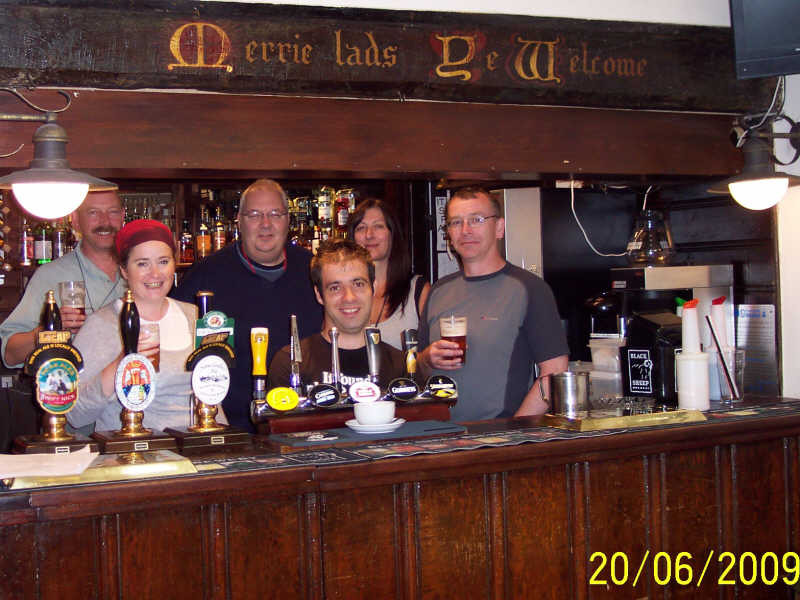 I do so appreciate all the personal effort you give in organising the Dave and Frank Memorial Fund event, and would be grateful if you would pass on my heartfelt thanks to everyone involved. It certainly is a great way of remembering friends, and keeping so many others at the same time. I know the lads would be proud of you. 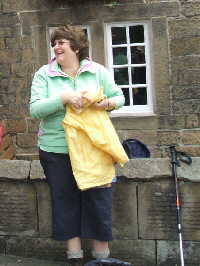 You know what it’s like when you’ve just completed a punishing sponsored walk. 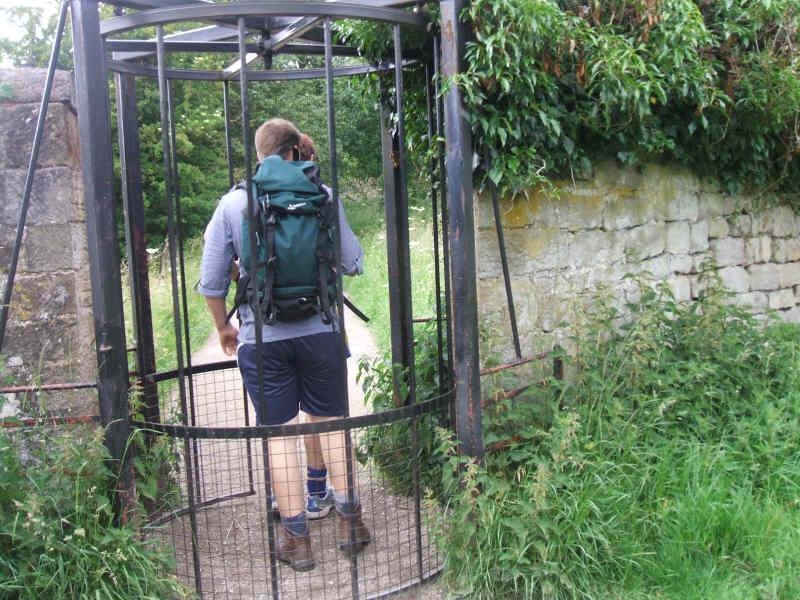 You’ve been up and down hills, up and over gates and climbed over stiles for 22 long, never ending miles. You just want to get to the final checkpoint, get signed off, and then sit down and have a quiet drink or two. 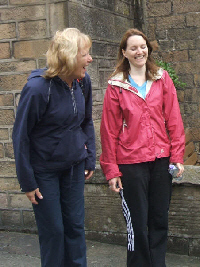 Even though the weather does it’s best to dampen our spirits, our walkers appear to have enough ‘spirit’ inside them to keep them laughing. Something is clearly making Ann Fisher, and Margaret Mackie and Louise Lavelle break down in fits of laughter at the Devonshire Arms Checkpoint at Beeley. I had a meal last night. I ordered everything in French... surprised everybody. It was a Chinese restaurant. I said to this Chinese waiter, "Look, this chicken I ordered has got one leg shorter than the other." He said, "What do you wanna do with it, eat it or dance with it?" I said, "Forget the chicken, give me a lobster," and he brought me this lobster. I said "just a minute, he's only got one claw." He said "Well he's been in a fight." I said, "Well give me the winner." Police arrested two kids yesterday, one was drinking battery acid, the other was eating fireworks. They charged one, and let the other one off. I told my girlfriend I had a job in a bowling alley. She said "Tenpin?" I said, "No... permanent."